Bedtime is such an important time to have a routine to us, because we work full time, we all need our sleep and if Noah doesn't sleep well, we don't work very well. So as soon as Noah was old enough to co-operate, we instilled a pretty firm one. One thing we always make sure we do, even if we're all shattered and Noah is up late, is reading a story. It's our little time, that even if the day has been hectic or hard, we can sit down, feel relaxed and get lost in a little book. Noah enjoys a few little cookies and a large beaker of hot frothy milk, whilst I babble away about Monsters and Bears. 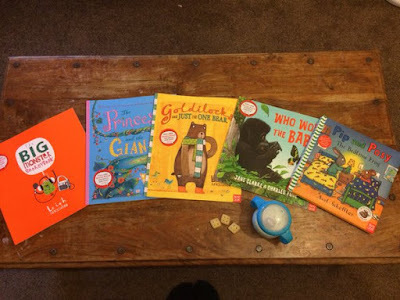 Above are some of our current favourites and are all on our reading shelves this month, published by Nosy Crow they are full of bold, vivid pictures, with enthralling stories along side, the pictures help Noah follow the story and keep him captivated throughout. I really feel reading to your child is so important, it's not only bonding but teaches them so much in the process. If Noah falls asleep in the car before we get home, I actually miss story time and feel a bit out of place, do you feel Story Time is an important part of a routine?